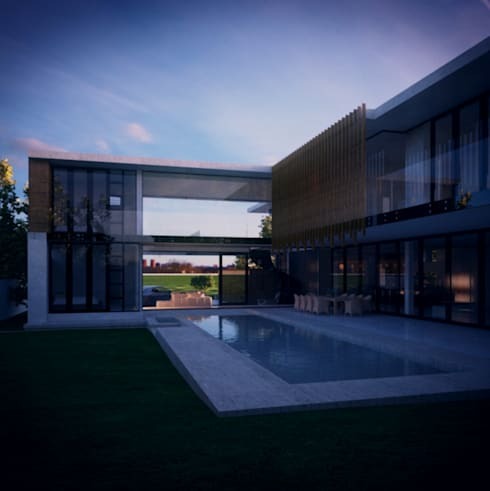 Johannesburg-based firm Eclipse Architects is in charge of today’s homify 360° gem, which sees a luxurious masterpiece specifically designed to meet the needs of its inhabitants. 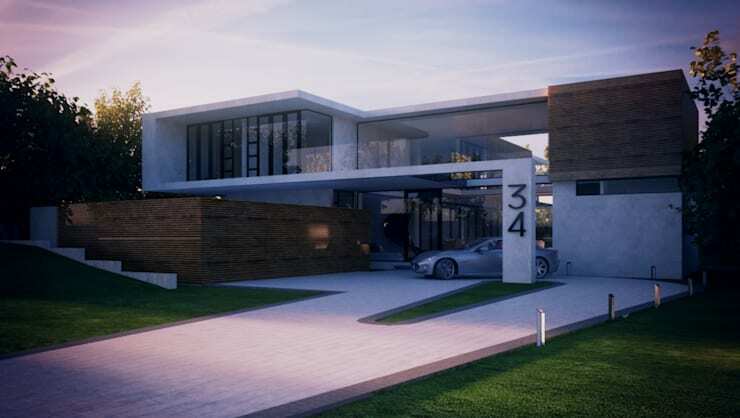 Located in Waterkloof Boulevard, this modern 835 m² design flaunts a double-storey delight. On the ground floor, we locate amenities such as two lounges, an open-plan TV room and dining area which open out to a cavernous patio, a cinema room, spacious chef's kitchen and a guest bedroom on the east away from the entertainment areas. The gardens are well manicured and take inspiration from the surrounding landscapes. The garden is carefully topped off with a beautiful raised lap pool running the length of the entertainment area. Its asking price? R7,8 million. But enough jabbering – let’s see some images! Even though we aren’t privy to interior images, these exterior shots give us a firm indication of the house’s sleek style, not to mention its size. This contemporary home blends wood, glass, travertine and an off-white tone in giving an aesthetic that is simple and yet eye catching. Its timelessness lies completely in the simplicity of the design. 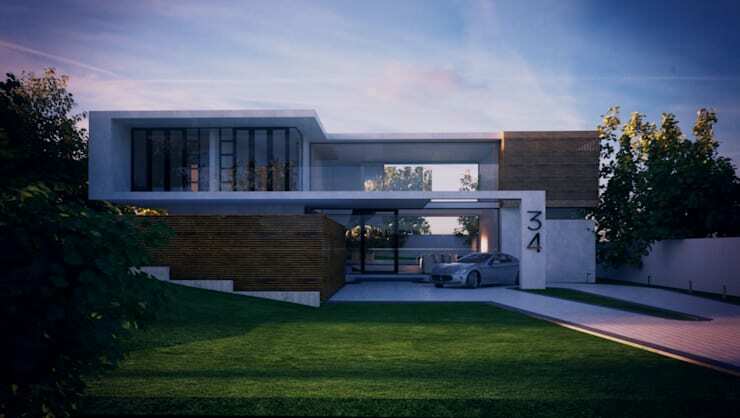 The house's contemporary status is not only highlighted in the aesthetics, but also in the efficiency of its design. 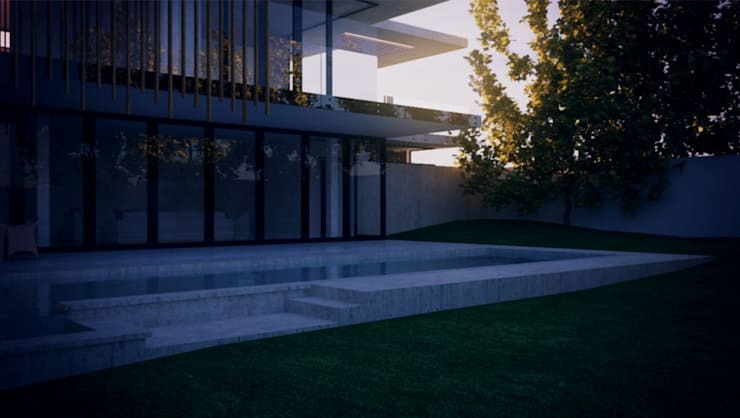 Rainwater harvesting, optimal solar orientation, cross ventilation, solar power back-up, low-emission glazing and great insulation are some of the measures taken to ensure that this home uses a minimal amount of power in maintaining a comfortable space inside. The super fabulous back yard is where we find the swimming pool, on which just about all of the rear-side rooms look upon. But what other fantastic spaces do the insides provide? A pyjama lounge with kitchenette, three additional bedrooms (all en-suite with private balconies), a gym and study finish off the first floor. The master suite enjoys fantastic landscape views, a large en-suite bathroom with separate toilet and shower closets, his and hers walk-in wardrobes, as well as a lounge area. We thought we’d treat you to one more look of the back yard, where you can see some landscape/estate views seeping through, as well as imagine yourself playing host to a fabulous little get-together while guests mingle and float in and out of this gorgeous structure. Most definitely a house to dream about! And speaking of dream homes, have you seen The family home with a beautiful interior?